Based on a post started by @HeavyG (here) and helpful responses, especially from @Focker, I decided to search a few antique shops and see what the excitement is all about. We visited two antique malls and three antique stores and were delighted at what we found. 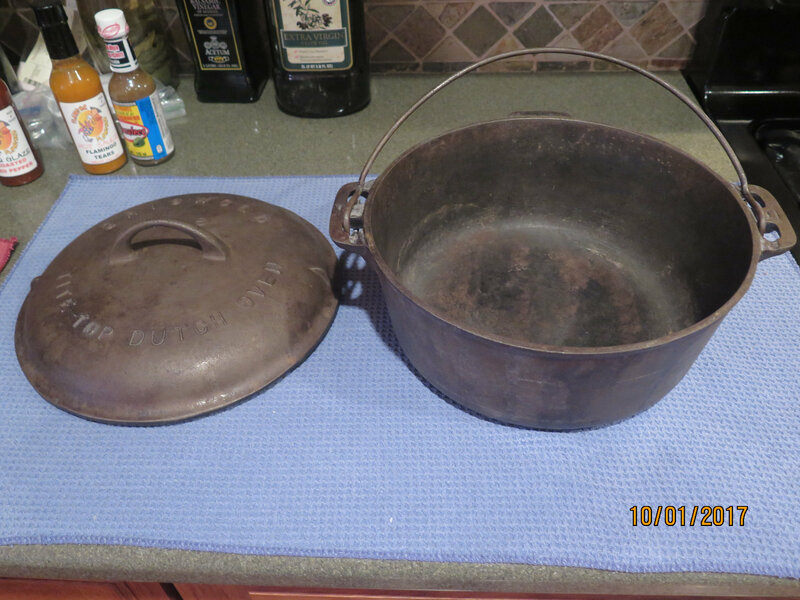 Here is a Griswold #3 sauce pan in very good condition, a #6 that needs some work and a #8 that's going to need major effort to restore. This dutch oven was a great surprise. Here's another picture of the #8. I've read a lot of whacky ideas of how to restore it. All suggestions for removal of the crud would be greatly appreciated. Last but not least is a Wagner Ware #8. It won't need much work to restore. The silky finish on the cooking surface is amazing. 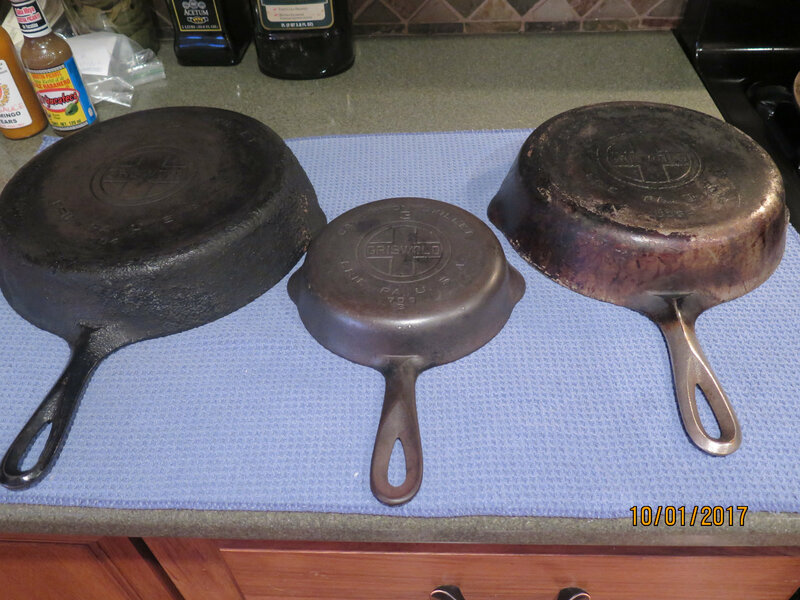 My Lodge pans and griddles are officially retired. AWESOME find! I found a #10 at a garage sale once for $2.00. I have a lye bath for the nasty carbonized pans, which can be found in the plumbing dept of some stores. Electrolysis is another solid option. Maybe @blasting could shed some light on his setup. Not a fan of the tossing in the fire or oven cleaner method. $2.00...incredible. Did you have to do a lot of work to restore it? @lvoyager Actually, not really any restore required! 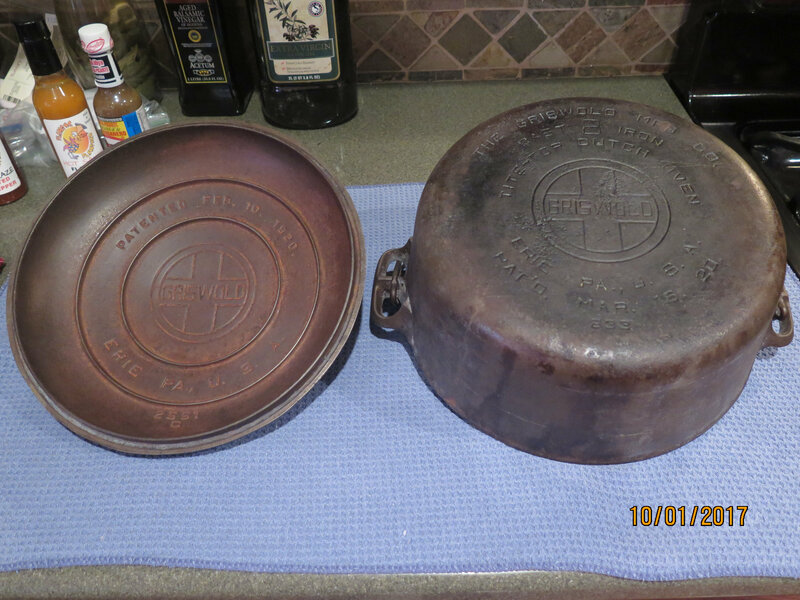 The pan had belonged to the grandmother of the lady having the garage sale and had been properly used and loved for the last 60 years. All I did was give it a rinse and it was ready to use. Wish I could find a nice Dutch Oven at a Thrift Store or garage sale like you - I have not been that lucky though - yet! Forgot to add, enjoy breaking in your new collection. 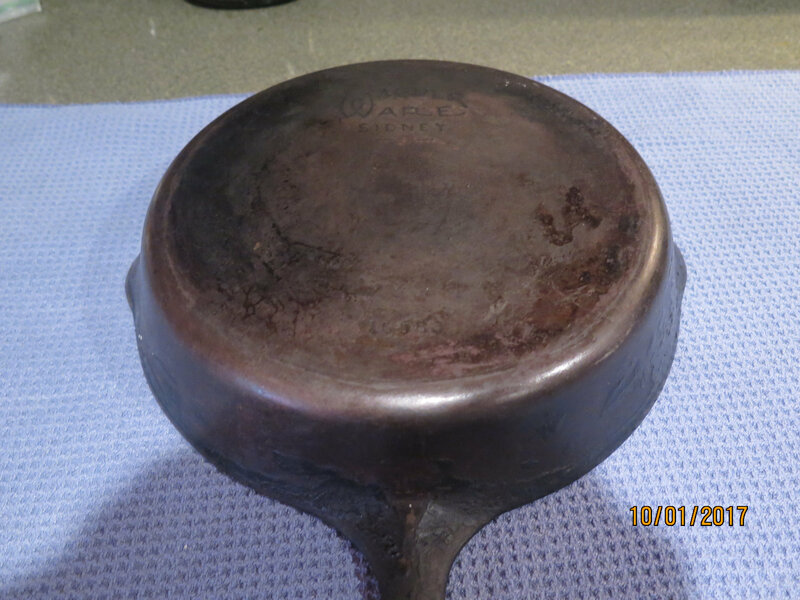 My first pan was a gunked up #8 EPU dickered down to $5. I could barely make out the logo. Post lye bath, it's back to square one. Some nice looking cast iron here! I have given up trying to use cast iron. I want to, but can't get it to work for me. Seasoned and re-seasoned and still doesn't work. Even bacon sticks. For the little I cook on the stove, I'll have to stay with the Calaphon. Nice job, @Focker. I'm going to try your method. The antique shop owner wouldn't budge off of $15 but since I missed buying the one at Goodwill I was happy with the price. Next time I'll ask you to negotiate for me. Save some bacon grease in a jar and spoon a little into your pan to keep the initial run of bacon from sticking. @lvoyager Actually, not really any restore required! 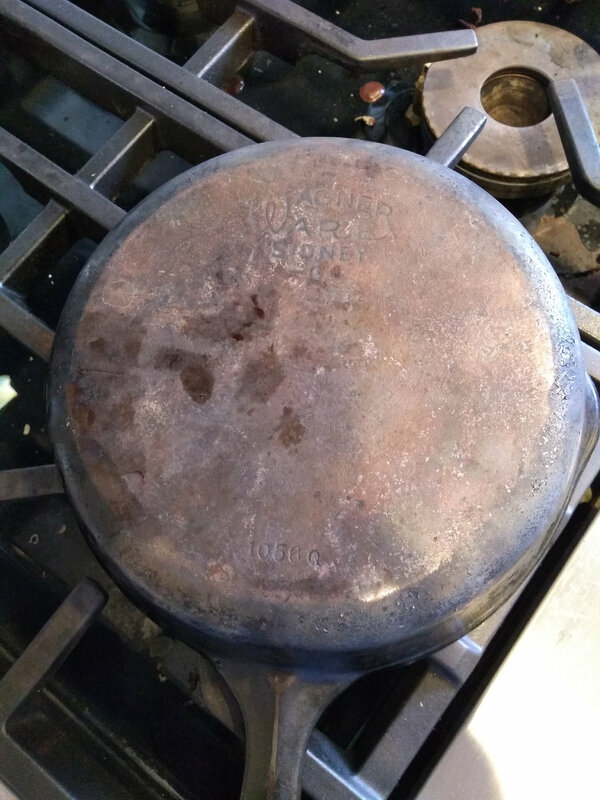 The pan had belonged to the grandmother of the lady having the garage sale and had been properly used and loved for the last 60 years. All I did was give it a rinse and it was ready to use. This ^^^^. That crust on the outside is just patina... character! $15 is a sweet deal. 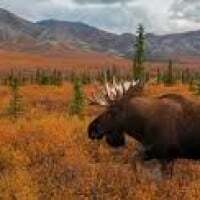 Nice CI finds! Welcome to another addiction that can be as strong as buying eggcessories . Electrolysis is easy, and inexpensive. It does a great job at stripping CI of gunk and rust. It also takes all the work out of scrubbing your Smokeware cap. All it takes is some wire, a battery charger, a bucket, some sacrificial metal, and some washing soda. Electrolysis does the work for you, working over hours, or sometimes a whole day. It's probably something worthy of a thread, as more than a few have asked me about it. It's pretty simple works better than anything else I've experience. I've made three different set ups in order to determine what works best. In order to save others the trial and error, I'll commit to doing thread on it sometime this month. This would be awesome. I may make the switch, haven't looked into it up to this point. And there seems to always be something in my lye bath getting stripped. All I know is, electrolysis works. After reading more about using lye I think I will try something else. I would have to leave the stuff outside where deer could get to it. I'll try Easy Off spray first. If that doesn't give the desired results I'll wait for @blasting instructions using electrolysis. With that #8, don't waste your time with EO. Trying to save you time and a little bit of money. My lye bath is in the garage on a work bench, with a sealed lid. I wear PPE, no issues. 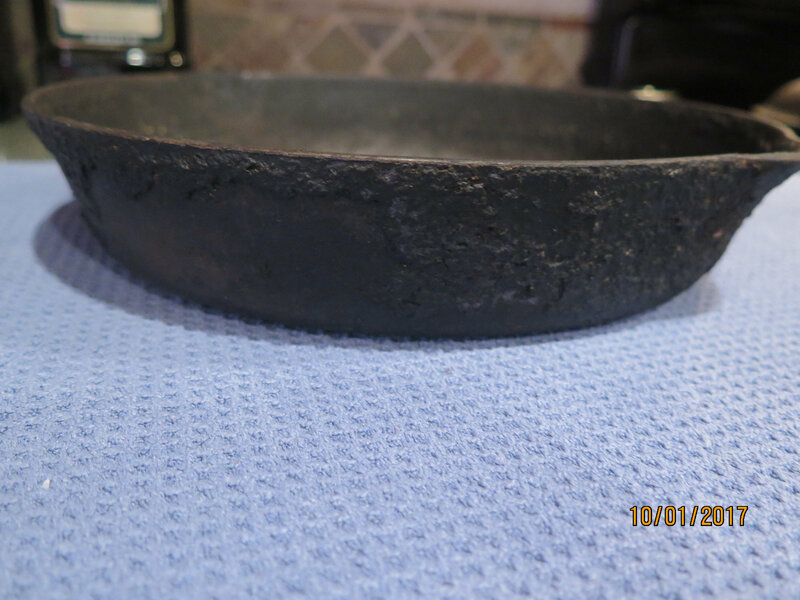 any knowledgabe antiquers here know if having a heat ring can help date a cast iron skillet? 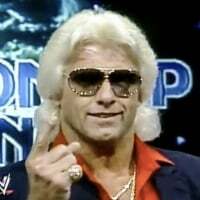 specifically for a few Wagners I picked up. a few have heat rings. did they start and/or stop using those during a certain era? 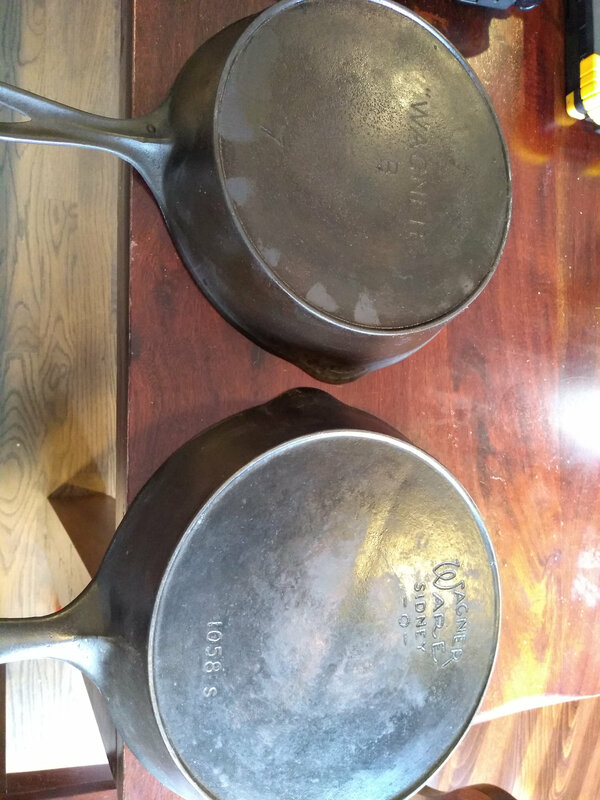 Wagner Ware started making cast iron in 1891. Some of their skillets had heat rings back then, some didn't. They stopped making CI with heat rings in 1935. You can zero in on the date by their many logos, although some overlap. Post a picture of the logo and I'll be able to help you further. Gonna chime in. For taking off crud I use a angle grinder with a soft wire brush. It doesn’t scratch the CI and takes just a few minutes. It will however get all over everything so wear old clothes. I use the egg-direct heat for curing as it keeps the smoke out of the house. 350 degrees and just keep slathering with veg oil and heating/drying out the oil, recoat and flipping now and again Usually takes me half a day in the egg. But comes out shiny black and the patina holds up. 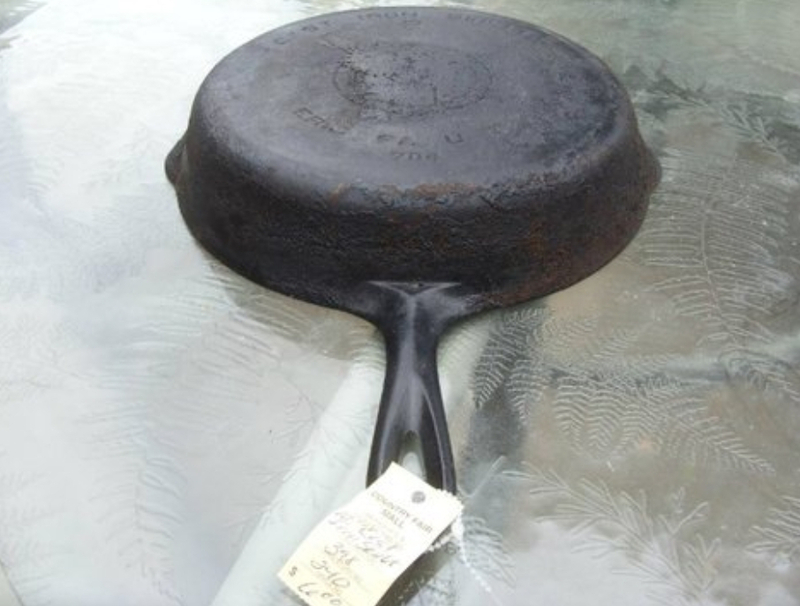 The top skillet was manufactured in the 1890's. That is a special, special pan. The bottom pan with the stylized arc logo was manufactured from 1924 to 1935. The earlier runs of this version had a single large single digit block number at the bottom and sometimes including a single letter instead of the 1058 S as on this one. As mentioned earlier, Wagner Ware logos overlapped from time-to-time so I can't get more specific but definitely 1924 - 1935. Thanks for that info. The #7 is super lightweight. Haven't tried cooking on it yet. How about this one? No heat ring, so a later era? Correct. 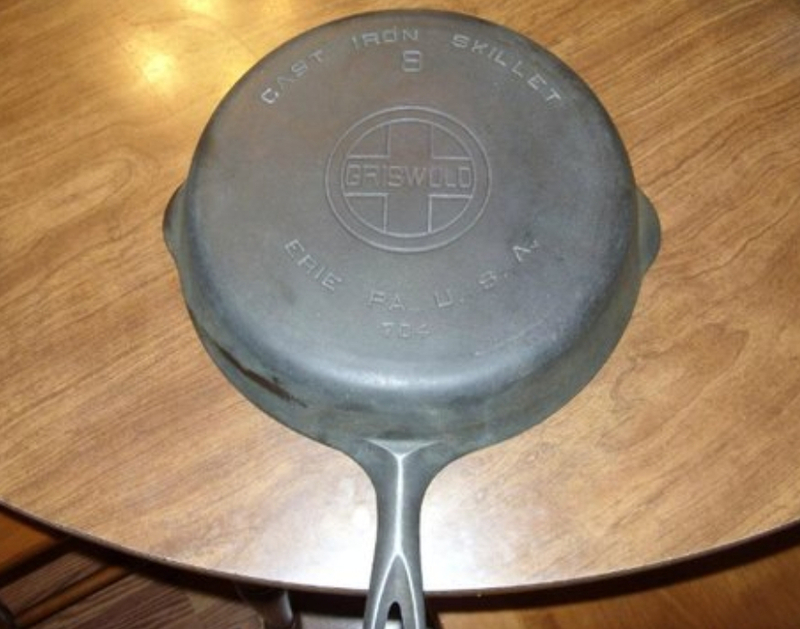 The smooth bottom skillets with that logo were manufactured from 1935 - 1959.